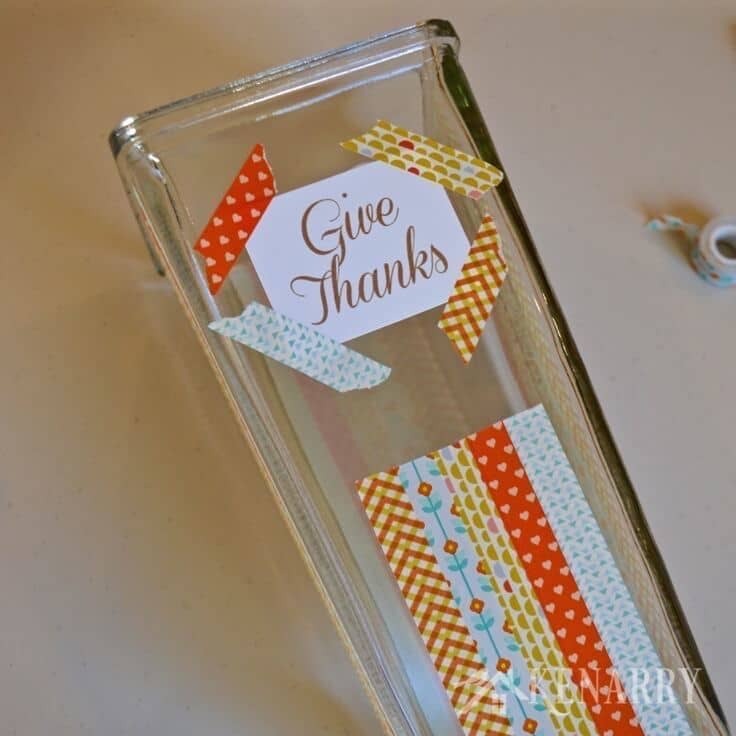 Today we’re sharing how to make a washi tape vase for Thanksgiving plus you’ll learn where to get tons of other washi tape ideas. Have you seen all the colorful washi tape at craft stores, but wondered what to do with it? Today I want to tell you about an incredible resource where you can find tons of great washi tape ideas, plus learn tips and techniques on how to actually use it. I’m also sharing a colorful washi tape vase you can make for Thanksgiving in less than an hour. Prepare to be inspired! After today’s post you’re going to want to run out and buy several rolls of washi tape. 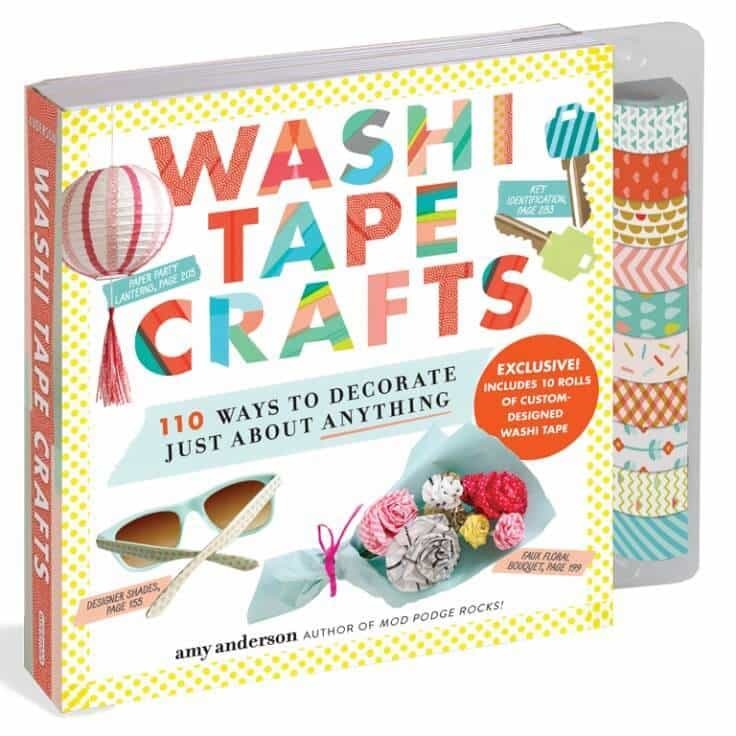 Disclosure: We received a complimentary copy of Washi Tape Crafts, a new book by Amy Anderson to review. No other compensation was provided, however this blog post also contains affiliate links for her book and other products or services we think you’ll like. This means if you make a purchase from one of these links, we’ll make a small commission at no additional cost to you so we can keep the great ideas for the home coming your way. All opinions expressed are our own, derived from our personal experience. Earlier this summer, we featured Amy Anderson in the Summer Spotlight. Amy is the creator of washitapecrafts.com, modpodgerocksblog.com, and the author of Mod Podge Rocks! 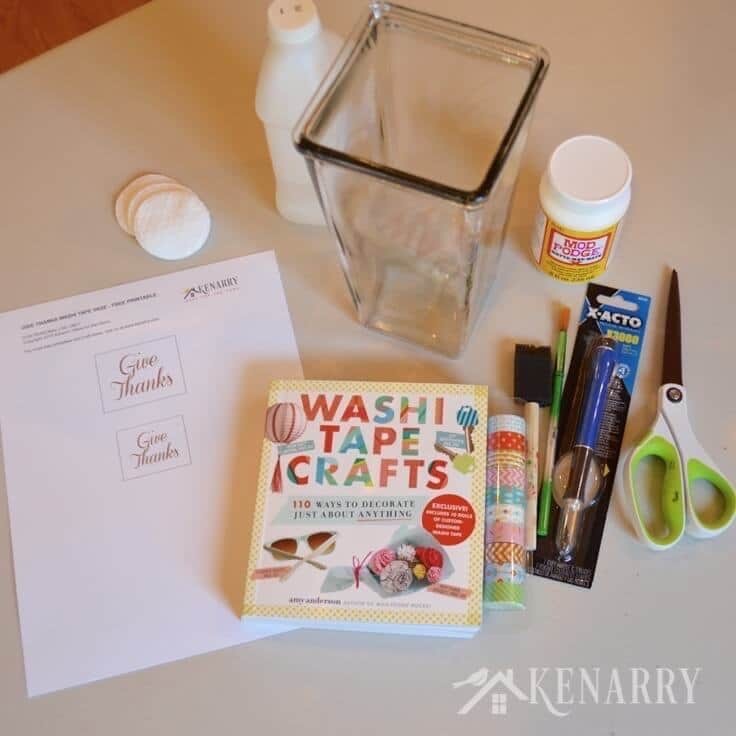 She always has brilliant craft ideas, so I was thrilled when she asked me to review her latest book, Washi Tape Crafts: 110 Ways to Decorate Just About Anything. The book is so fun and actually packaged with ten rolls of washi tape (18 feet each) in custom-designed patterns made especially for this book. It’s incredibly cute, compact and useful — a perfect stocking stuffer for a craft lover in your life! I don’t know about you, but I’ve been admiring washi tape at craft and department stores for several years. There are so many fun colors, styles and patterns available, it’s almost overwhelming! I never bought any though because I wasn’t sure what I would actually do with it. Thankfully, Washi Tape Crafts includes color photographs and step-by-step instructions for 110 different washi tape ideas including one-of-a-kind gifts, home decor, jewelry, holidays and other celebrations. 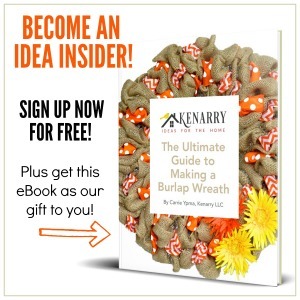 What I really appreciated though is that the book includes more than just washi tape ideas. Amy also teaches key techniques like precision tearing, wrapping, weaving, how to make bows, flowers and other shapes plus how to seal and weatherproof designs to make them more permanent. I couldn’t wait to make a project of my own using some of Amy’s washi tape ideas after reading her book. 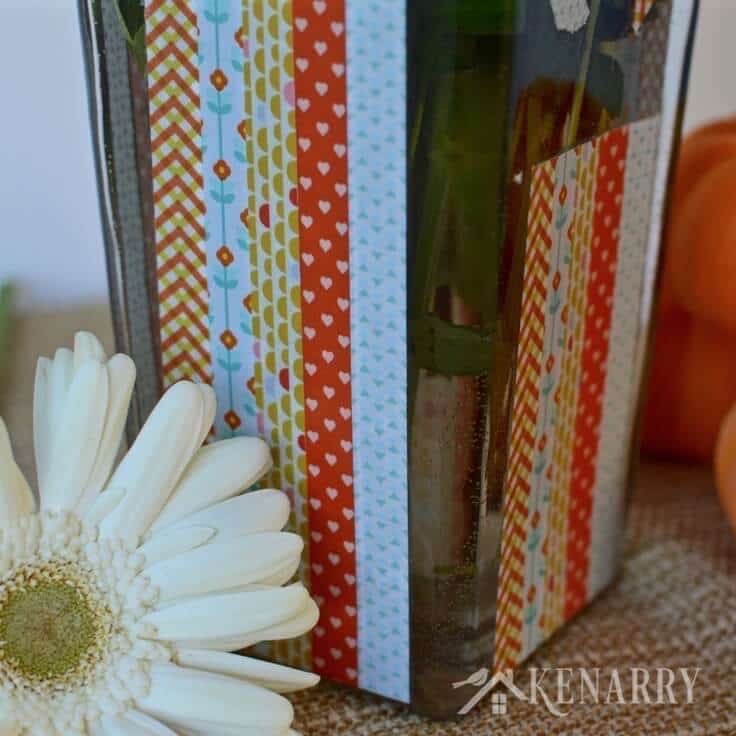 One of the washi tape ideas Amy shares is how to decorate a vase using vertical strips of washi tape up the sides. With Thanksgiving coming up soon, I decided to put my own spin on the idea by adding a “Give Thanks” message and a special inscription for someone I’m especially thankful for this year – my dedicated Bible study leader and faithful friend, Erica. 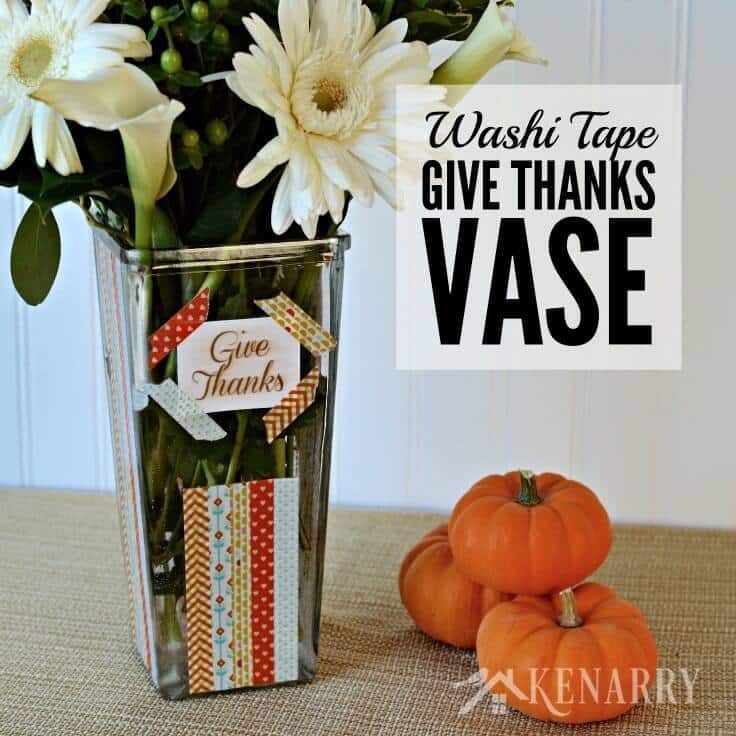 Making a Thanksgiving vase using washi tape is incredibly easy. I’ve got to be honest, until I read Amy’s book and played around with the washi tape that comes with it, I had no idea washi tape was removable, let alone how remarkably easy it is to use. 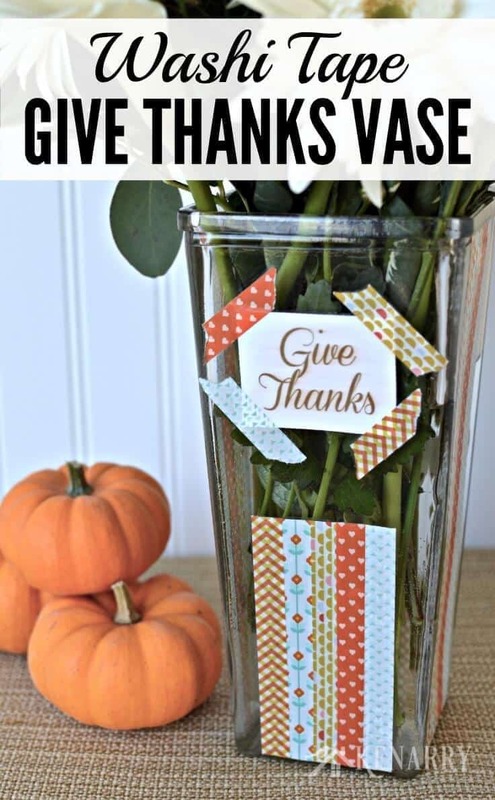 It seriously takes less than an hour to make this Thanksgiving vase, not including the drying time for Mod Podge used to seal it. 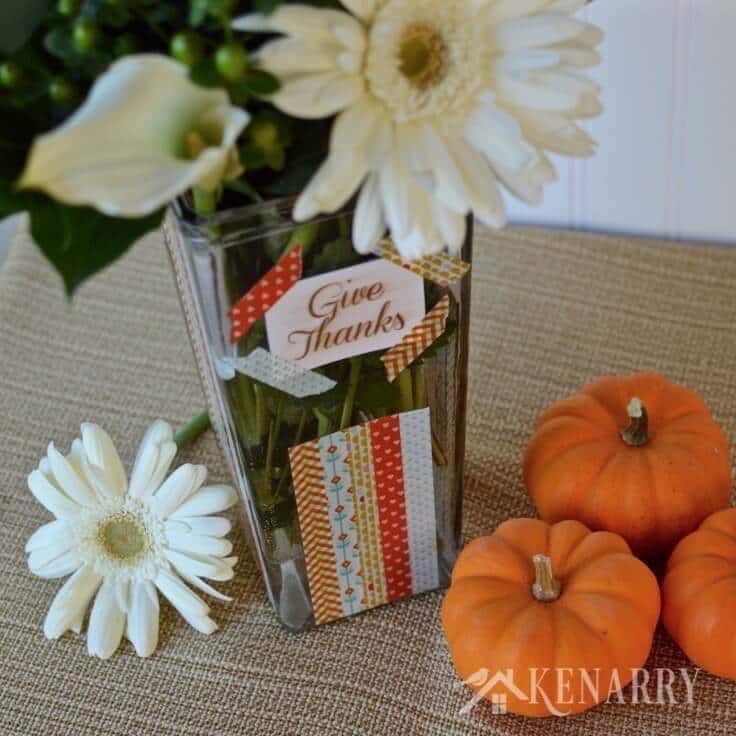 Washi Tape Crafts by Amy Anderson – If you want your Thanksgiving vase to look just like mine, you need the washi tape that comes with Amy’s book. 1. Wash the vase. It’s important to start with a clean surface that’s free of dirt or lint. Wet a cotton ball with rubbing alcohol and wipe down the outside and inside of the base. The alcohol will evaporate and dry quickly so you can move to the next step. 2. Cover the vase in washi tape. Run washi tape vertically down the sides of the vase. For mine I used five different complementary colors/patterns that came with the Washi Tape Crafts book. You can measure if you want, but I just eye-balled it to determine where the center of each side was. Don’t worry about getting the ends even or perfect. You’ll trim them in the next step, so just rip the washi tape or cut it with scissors when you’ve gone the entire length of the vase. Repeat with any remaining colors or patterns of washi tape on two more sides of the vase. 3. Trim the washi tape. 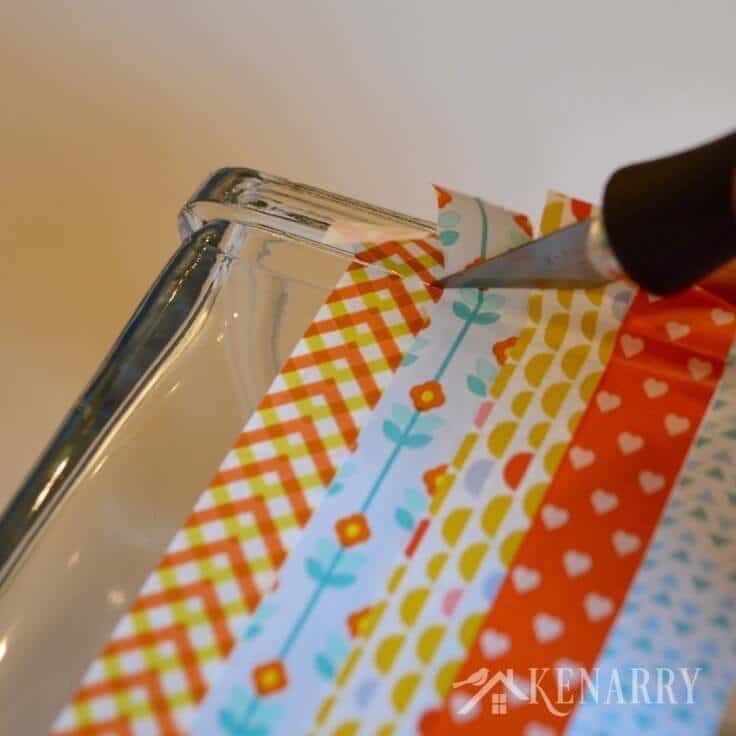 Use an X-acto knife to cut a straight line along the top and bottom of the washi tape on each side of the vase. The washi tape scrap ends should then be really easy to remove. 4. Print and cut the Give Thanks Message. 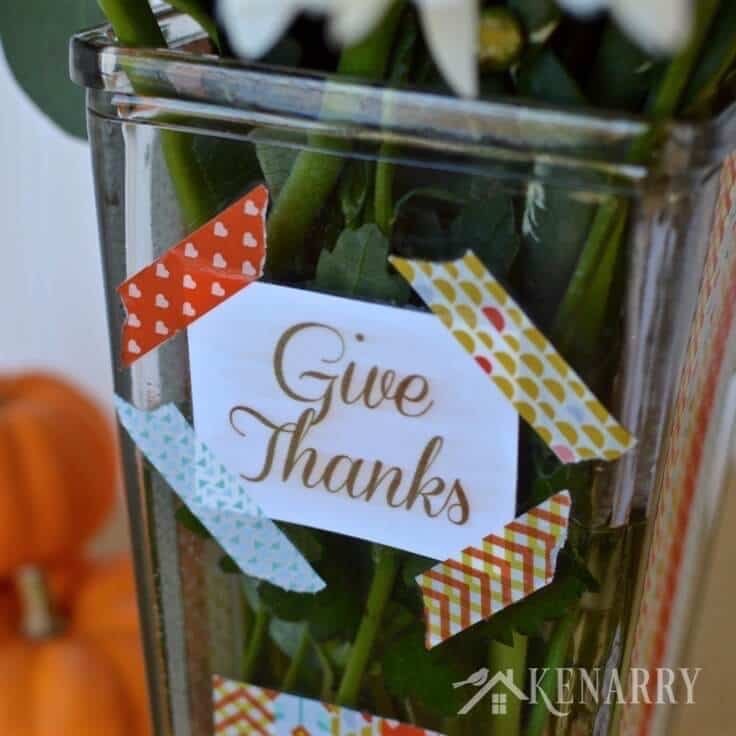 Download the Give Thanks Washi Tape Vase Free Printable (406 KB PDF) and save to your computer for your own personal use only. Print the Give Thanks Free Printable in color on white card stock and cut around it using scissors. I included two different sizes so you have options depending on the size of your vase. If you want to add an inscription for a friend to the inside of your vase, now is the time to write it on the back side of the Give Thanks message. Make sure the ink is dry before you move on to the next step to prevent smearing. 5. Glue the Give Thanks message to the vase. Use a paint brush to lightly spread Mod Podge along the back side of the Give Thanks message and apply it to the side of the vase. Once you have it secured in place, apply a thin layer of Mod Podge across the front of the Give Thanks message. 6. Apply washi tape to the Give Thanks message. 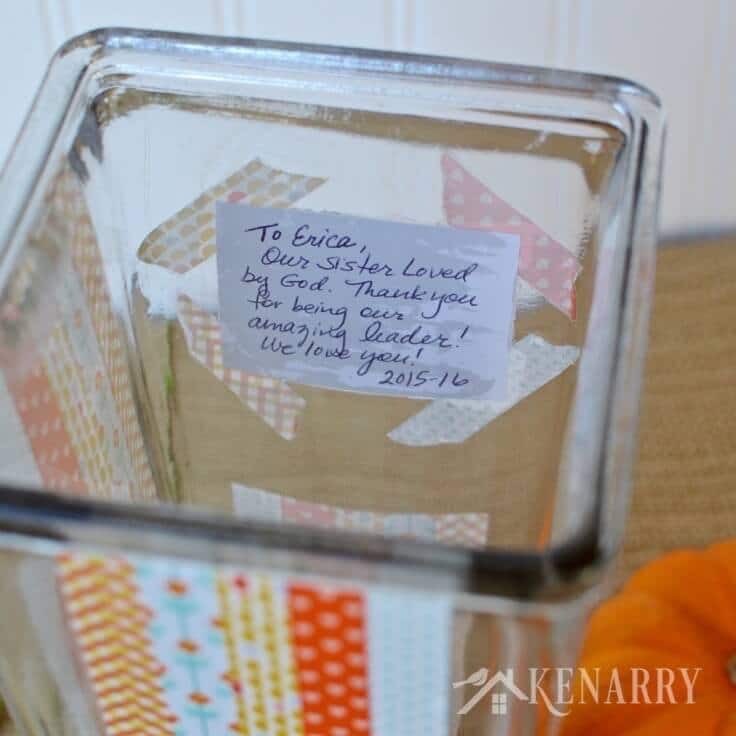 Tear off small pieces of washi tape in assorted colors and apply it to the corners of the Give Thanks message. I chose to rip it to give the vase a whimsical, fun look, but Amy mentions other cutting techniques you can use with washi tape in the Washi Tape Crafts book. To finish the front of the vase, I also applied five vertical strips of washi tape like I did on the sides and used the X-Acto knife to trim it into a straight line. 7. Coat the washi tape with Mod Podge. 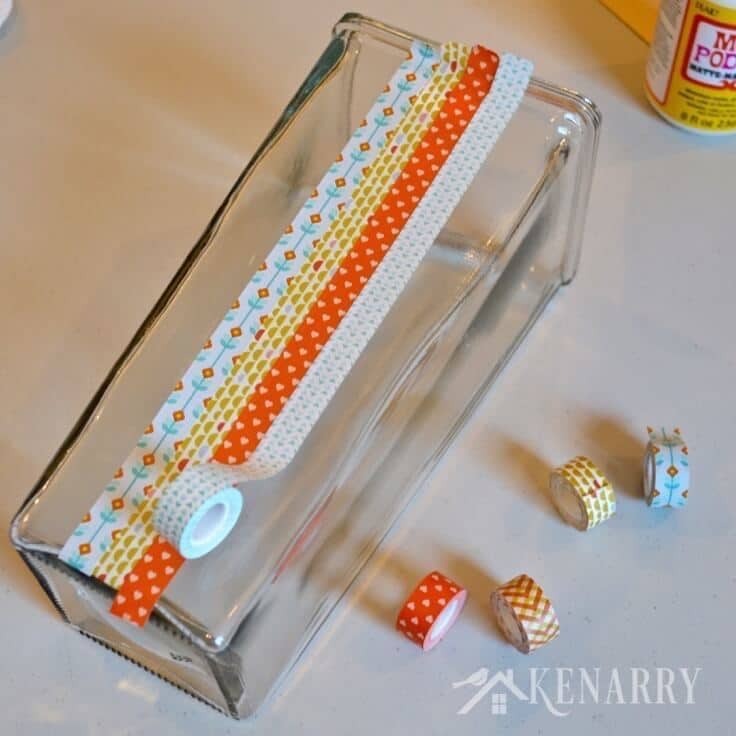 Since the vase will be filled with water, you want to make sure the beautiful washi tape you just applied will be water resistant. 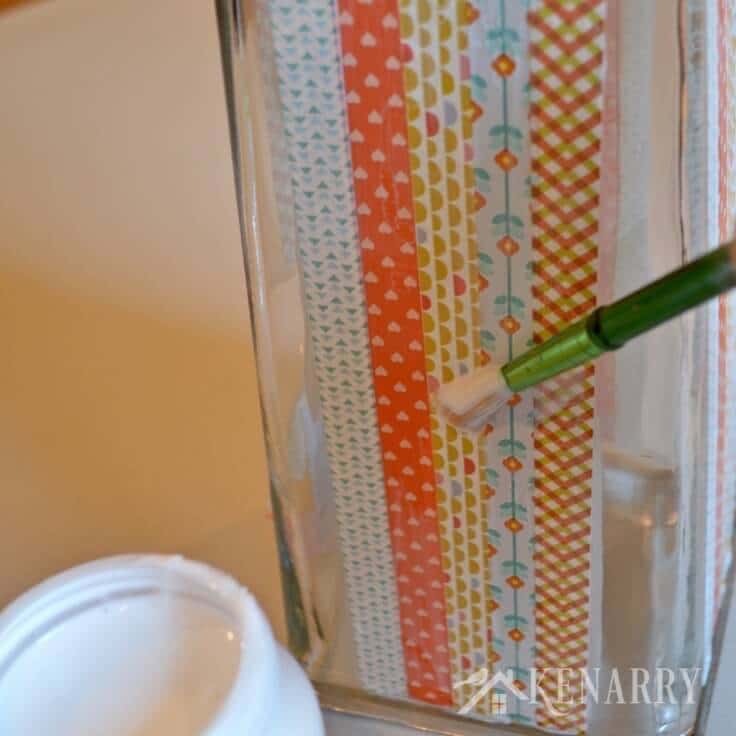 Use a paint brush or a paint sponge to apply Mod Podge on top of the washi tape on the front and sides of the vase. Make your layers smooth, but don’t worry if the Mod Podge goes over the edges of your washi tape onto the glass. Allow 15-20 minutes for the Mod Podge to dry between coats. I ended up applying three coats of Mod Podge to the washi tape on each side of the vase and the Give Thanks message on the front. 8. Clean the excess Mod Podge off the glass. Once all the Mod Podge layers have dried, you can use the tip or blade edge of the X-Acto knife to clean the excess Mod Podge off the glass. Be careful not to scratch the washi tape with the X-Acto knife. You should only be touching the glass. This step reminds me of a dental hygienist cleaning plaque off teeth. With Mod Podge over the washi tape, the vase is now water resistant. I would not submerse the Thanksgiving vase in water, run water directly over the sides of the vase or run it through the dishwasher. To clean the vase, just wash the inside with a damp rag. 9. Fill the Thanksgiving vase with flowers and give away. Put together a bouquet of your friend’s favorite flowers or gather a festive arrangement for Thanksgiving. 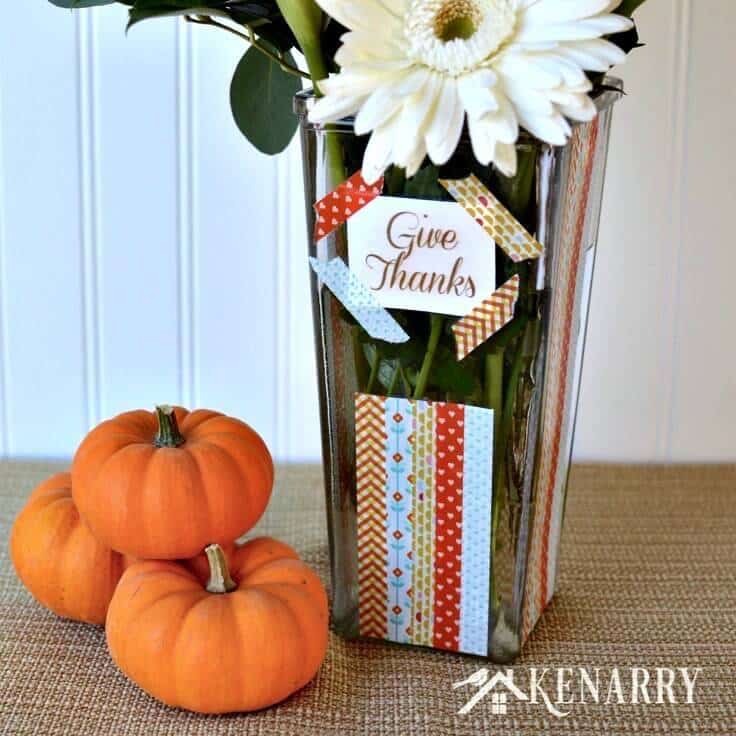 Add a thank you card and you’re ready to give this Thanksgiving vase to someone who deserves your gratitude this year. It would make a great hostess gift, a present for a neighbor or pick-me-up for a friend. My Bible study group gave this colorful Give Thanks vase to our leader several weeks before Thanksgiving so we included a gift card so she could buy flowers to fill it before she hosts her family at her house for Thanksgiving. 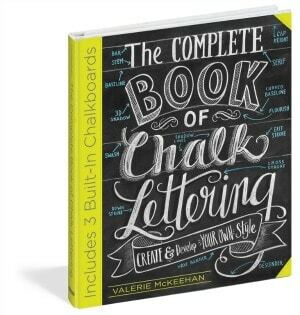 If you’re a fan of craft books and tutorials, you should also check out “The Complete Book of Chalk Lettering: Create and Develop Your Own Style” by Valerie McKeehan. The publishers sent me a complimentary copy when they sent Amy’s Washi Tape Crafts book.